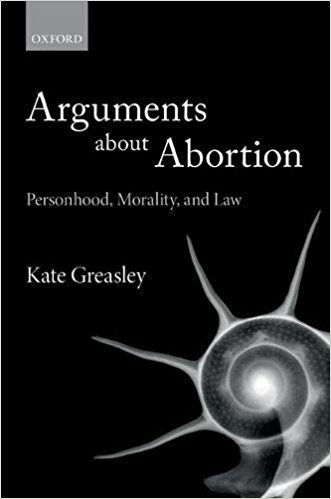 Arguments About Abortion: Personhood, Morality, and Law is a book published in 2017 by Kate Greasley, a British lawyer. This book took me by surprise as I didn’t hear about it until earlier this year. It also seems to have slipped under the radar, having only one review at the time of this review’s writing on Amazon and none on Goodreads. However, I would say, without exaggeration, that Greasley’s book is an important contribution to the discussion on abortion and for anyone who wants to understand this issue, this book is required reading. I read a lot of books by pro-life and pro-choice advocates. It’s not often that a good pro-choice book comes along, one that not only makes a compelling intellectual and articulate case for the pro-choice position, but also interacts with the best of the pro-life academic literature on the topic. The best book defending abortion before this one was David Boonin’s 2002 book A Defense of Abortion. Now I can place this book alongside Boonin’s as one that anyone who wants to educate themselves on the issue must read. Greasley’s book is in three parts. In the first part, she examines arguments that try to show that the question of personhood is irrelevant to the abortion debate, including 1) Thomson’s bodily autonomy argument justifies abortion whether or not the unborn are persons, 2) that abortion can be justified as an act of self-defense, and 3) Dworkin’s “red herring” argument, that at the heart of the issue is not really personhood but that pro-life people believe that life is sacred and inviolable. Greasley interacts with these, and others, dispatching them, showing that these arguments do not justify abortion if the unborn are persons. So the personhood of the unborn is the central issue regarding whether or not abortion is moral. The second part of her book is where she makes her case that the unborn are not persons. The third part of her book talks about issues regarding abortion law and regulation. I will not look at her arguments in part one since I agree with her position. I also won’t look at her arguments in part three because they really depend upon her arguments in part two succeeding. So I will leave that up to the reader to follow up there. I do want to look at her arguments regarding personhood. I don’t believe her arguments succeed in justifying abortion for the reasons that I give below. While Greasley’s case is intelligent and articulate, I believe that her case fails for one important reason: She interacts with some of the best pro-life thinkers, but she only interacts with two main views of personhood among pro-life advocates: substance dualism and animalism. She doesn’t interact with hylemorphism, such as that held by Edward Feser. The reason that this is important is not just because she neglects to interact with a feasible account of personhood, so considering that she hasn’t refuted it, her own argument that the unborn are not persons fails. But it’s also important because the criticisms she raises against substance dualism and animalism are easily answered by hylemorphism. So it can give the impression that there are no good responses from pro-life advocates when in fact there are responses to these concerns already in the literature. That being said, I’ll address two of her main contentions in the book: that the unborn do not count as persons, and that pro-life personhood accounts also suffer from various amounts of arbitrariness. Greasley takes the position that personhood is a gradual property, not an all-or-nothing one. Similar to Mary Anne Warren, she takes personhood attributes to be the fully realized, presently exercisable capacities that typical human adults exhibit. Human adults are our paradigm case for persons, and when you ask what capacities they possess that other creatures, which we don’t consider persons, lack, these are things like rational thought, the ability to communicate, etc. These, of course, are gradually developing properties. But since early embryos lack these capacities, just like creatures who are non-persons lack them, they are not persons, either. However, while personhood develops gradually, there is a definite point at which we should establish legal personhood, even if the unborn are not yet persons in the moral sense. She thinks that the unborn don’t become persons in the moral sense until sometime after birth, but that we should establish birth as the point at which we establish personhood legally. So she would take personhood not to arrive at a certain threshold, which someone like David Boonin would take to be a set point, Greasley takes personhood to be a ranged property. A ranged property, she explains, is some arbitrarily determined point at which we will establish that all who meet these qualifications will be considered persons (paraphrased, p. 183). Regarding the fact that not all human beings who are born lack these personal properties that adults exhibit, she further explains, “[a]lthough human beings in general meet the condition, there are of course some individuals who fail entirely to realize that capacity or who realize it only to a minimal degree, perhaps as a consequence of some unfortunate defect or deprivation” (p. 183). In other words, some human beings may fail to exhibit the properties that adult humans exhibit which make them persons. But as long as they fall under the legally recognized range of personhood, they are persons, no matter how closely they resemble adults, the paradigm case. To even further explain the concept of a range, you might think of the state of California. Fresno and Blythe are both cities in California. Fresno is further into California than Blythe is, Fresno being in the center and Blythe being near the border to Arizona. But even though one city is clearly further inside California than the other, both are considered California cities because they are inside the state boundary. Of course, Greasley recognizes that a possible retort is that this argument attempts to have it both ways, that personhood is binary (i.e. you’re either a person or you’re not) and that it supervenes upon properties which come in degrees. So the question is, why draw this line at birth instead of some other place? She offers the following as reasons that birth, rather than some other range, should be considered as the range property that establishes legal personhood. She considers an argument for legal or pragmatic interests, but considering that it has some unpalatable consequences (such as mentally handicapped people being legal persons only by “polite extension”), she presents arguments that this range is acceptable as morally necessary, as well. 1) Opacity respect — Greasley considers that her argument might appear circular because it claims that there is a moral interest driving the specification of “person” as a ranged property, yet this moral interest exists only if all individuals within the range actually are persons. But this is what personhood accounts grounded in gradual properties seem to deny. So she introduces the concept of “opacity respect” as a way to try and ground an independent moral reason for focusing on the ranged property, one that is independent from a prior commitment to equality. Opacity respect, borrowing from Ian Carter, is simply that a respect for human equality requires maintaining a sort of blindness toward their individual capacities. We treat them as equals regardless of how developed their capacities are. However, rather than avoiding the charge of circularity, this only pushes the problem back an extra step. As Calum Miller responds, either humans are morally equal or not. If they are not, then it is implausible that we are in any way required to treat them with respect. The only way we would need opacity respect is if they are already equal. (Calum Miller, “Arguments About Abortion: Personhood, Morality, and Law Book Review”, The New Bioethics, Vol. 24 No. 2, 2018, 190-195). So the charge of circularity stands. 2) Some arbitrariness in the law is unavoidable. Consider the seven month cut-off for prosecution of a serious criminal offense. This is an arbitrary limit set which permits some prosecutions which shouldn’t be permitted and precludes some which ought to be permitted. Stipulating personhood at conception is unsatisfactory due to how far away those organisms are from the sorts of creature which exemplify personal properties, and putting the threshold at birth is not unacceptably arbitrary, as shown by the case of criminal prosecution. But the event of birth is favorable for several reasons: It is a highly visible event, it is not speculative, and it is an easy guideline with which to comply. By contrast, other milestones (those before and after birth) are less visible and easier to mistake or conflate with other events. Now while it’s true that birth is a highly visible event, this is hardly grounds for favoring birth over conception. After all, even though it’s not visible like birth is, every embryo that implants itself in her mother’s womb was conceived. The fact that we couldn’t see it doesn’t mean the event isn’t significant. Also, while birth is not speculative, it is not always safe for the unborn child. Unborn children should gestate for 40 weeks. A child born too prematurely faces developmental problems, if he even survives at all. Yet this argument seems to suggest that we can intentionally induce birth at any stage of development, and you haven’t actually harmed the entity in question, despite now being born with developmental issues that you purposely caused. Additionally, while the date of conception may be speculative, the fact of conception is not. The fact that we can’t accurately pinpoint the exact date of conception is not an argument against conception being the event that establishes personhood in an individual. 3) There are good reasons for favoring birth as the legal threshold for personhood over other thresholds. These reasons are: 1) Birth is a watershed event in the life of a human because “emergence into the world marks the beginning of a human’s exposure to the objects of mental experience and enables the discriminations necessary for conscious self-awareness and the basic understanding of where we end and everything else begins” (Greasley, Arguments About Abortion, p. 194). 2) At the point of birth, the neonate attains separate embodiment in the world. Regarding her first point, it’s really meant more as a response to pro-choice philosophers who argue that there’s no significant difference between a late-term fetus and a newborn. Greasley’s point is that there are significant differences that aren’t usually mentioned by these philosophers that show that we can support late-term abortion but oppose infanticide because of these changes. Now, Greasley’s discussion here is interesting but ultimately I think she misses the point of the arguments by these philosophers (and gets some facts about the late-term fetus wrong). These philosophers don’t necessarily claim that there are no differences at all, but in the way that is morally relevant (such as needing to be self-aware to have a right to life), there is no significant difference between the two. However, there is no real need to belabor the point or offer much of a response, since this is a point toward these other philosophers and not a general defense of her position. All I need to say is that even though her argument here makes sense in the context of arguing for abortion rights at birth rather than later, she is still placing one’s personhood in a developmental milestone, so her argument is no more successful than Sumner’s argument that sentience is what matters morally, or Tooley’s argument that self-awareness is what matters morally. Regarding Greasley’s second point, it is still largely a response to the other pro-choice philosophers who might place personhood threshold in some other property (this is largely because she has dismissed the conception threshold out of hand with arguments that I will address below). In order to support her contention, she points to the existence of conjoined twins, using Abigail and Brittany Hensel, who are conjoined below the neck, as her example of such twins. She claims that despite there being two “separate and distinct little girls,” each one having an independent mental life and personality, their connectedness diminishes their personhood because of things such as their inability to live the kind of life distinctive of persons. She goes on to say that the fetus’ attachment to the woman is more extreme than that of the Hensel girls, but she asks us to consider another pair of conjoined twins. This time one twin is completely enclosed within the other but still is bodily sustained and possesses a mental life. She claims that many of us would doubt that it is still correct to call this individual a person. She claims this shows that there is a level of enmeshment beyond which much of the meaning of personhood is lost. The problem with Greasley’s claim here is that she doesn’t support it at all, merely pointing to what she thinks many of us would accept as a person. But why shouldn’t we consider Greasley’s second pair of twins both persons? I see no reason not to consider the enclosed twin a person, especially since my conception of person has to do with one’s nature, not with the functions one can perform. Greasley offers no supporting arguments for her assertion besides the one I just addressed, so her argument is not a very strong one, especially considering how strong the arguments for personhood established at conception are. Greasley refers to the idea that personhood comes into existence at one time “punctualism,” as opposed to “gradualism,” the idea that personhood is a property that comes on gradually through the development of some characteristic seen as morally relevant for personhood status. Greasley goes on later to critique arguments made by Robert P. George and Christopher Tollefsen in their book Embryo: A Defense of Human Life. I hold to a different account of personhood than George and Tollefsen do, and they can respond to Greasley’s charges, if they wish to. I hold to hylemorphism, similar to that held by Ed Feser and David Oderberg, an idea that Greasley doesn’t critique in her book. So I will respond to the arguments in her book which could be directed toward hylemorphism. She trots out a few reductios against the idea that personhood is established at conception. I’m not going to address them here because they are in the context of giving an overview of the discussion within the abortion topic. She also trots out some reductios against personhood being established at other points along human development. Additionally, I have responded to these reductios elsewhere, as have other pro-life writers. She then goes on to argue that the conception thesis is just as arbitrary as the other personhood criteria that pro-life people allege are arbitrary. She alleges there are three ways in which those who are punctualists are arbitrary: 1) In assigning our value in our species; 2) They don’t treat like cases alike; and 3) Sorites-susceptibility. First, the charge is that by placing personhood in one’s humanity, we are being arbitrary because species membership is irrelevant to one’s moral status. One might consider it not seriously wrong to abort a cat fetus, but a human fetus is no more sentient or intelligent than the cat fetus. The only main difference is its species. This is to arbitrarily prefer one species over another without reference to morally differentiating characteristics. Greasley’s pro-life formulation is true as far as it goes, but she doesn’t give the full argument. It’s not simply that human embryos and fetuses belong to a species the typical adult members of which are capable of higher forms of thinking. It’s that human nature is a rational nature. The reason that human embryos will grow up to be self-aware, conscious, etc., is because they have a rational nature, which grounds all of their capacities. So it’s not just simply that they possess these capacities that they will develop in time, it’s that they have a rational nature which grounds these capacities. This rational nature is what grounds our personhood. Since all of the changes I eventually undergo are changes that are within my nature (or my internal programming) to undergo, I remain the same entity through all points in my life. There is no substantial change that happens, even though I get bigger, I develop a brain and get smarter, etc. None of these things changes me from one thing into a completely different thing. Since I am the same individual through all points in my life, if I have a right to life as an adult, I had one as an embryo because our rights are intrinsic to us; they are not established by anything outside us. Her second charge is that we are not treating like cases alike. If it is not seriously wrong to abort a cat fetus, then since human fetuses are like cat fetuses (in the sense given above), it is arbitrary, then, to claim that aborting human fetuses is seriously wrong. However, the response above will outline why this is not an adequate charge against punctualists. Cat fetuses and human fetuses are not alike. Cat fetuses lack a rational nature and human fetuses have a rational nature. It is the rational nature that makes it seriously wrong to kill you, not mere species membership. And as an aside, I don’t think that necessarily justifies aborting cat fetuses, either, but that discussion is outside the scope of this review. Now, the problem with this kind of argument is that it does commit a logical fallacy — the aptly named “fallacy of the heap”. Just because we can’t pinpoint when X occurs does not mean, necessarily, that X doesn’t happen. This fallacy is also sometimes called the fallacy of the beard, because this example is used to illustrate it: We know what a clean-shaven face is and we know what a bearded face is. But just because we can’t pinpoint how many hairs are necessary to be considered a beard (as opposed to merely stubble) does not mean we can’t recognize a beard when we see it. So when we point to a personhood criterion, say sentience, just because we can’t tell at exactly what point sentience arises, doesn’t mean we can’t know when something is sentient. So this is not an argument I would make, and I don’t think any of the best Christian thinkers use that kind of argument, either (Greasley points to something Kaczor wrote in his book, but she’s misunderstanding the point of Kaczor’s argument). However, Greasley forgoes the route of accusing pro-life people of arguing fallaciously and instead decides to argue that pro-life people can’t escape the charge of arbitrariness here. She claims that describing conception as a “discrete, identifiable ‘moment’ is considerably misleading,” and then she points to various stages and events that happen during fertilization in order for conception to occur. She asks questions such as, “”If penetration of the egg is the moment, how far must the sperm penetrate before a person exists, and why is any one of those microscopically distinct advances more significant than the adjacent ones?” and so on (Greasley, p. 115). However, her various questions don’t show that conception is an event that is susceptible to the sorites problem. When a pro-life person makes this argument, he is speaking of a human being that is already in existence and trying to show that placing personhood at one exact moment is arbitrary (e.g. if you need brain activity, how much brain activity is needed to be considered a person?). But in the case of fertilization, you are going from non-human entities to a human entity. Fertilization is a process, yes, but it is not a process of sperm and egg becoming human and then the human continues from there. In the process of fertilization, the sperm and the egg literally cease to exist and give rise to a new human being, and that event definitely has a point of occurrence. When the woman’s ovum ceases to exist and the new human zygote comes into existence, that is when conception finishes. This review was rather long, but I felt it necessary to address several of the arguments Greasley made in her book. Again, Greasley’s book is meticulously argued and is required reading for anyone who wants to keep up with the academic discussion on abortion. Her arguments don’t succeed in justifying abortion, nor do her arguments show that a “punctualist” view of human personhood is mistaken.